Mines ROTC members present the colors in 1925. Sixteen miles into the 2016 Bataan Memorial Death March, Army ROTC Cadet Parker Bolstad felt his quads seize up, and he collapsed to his knees. He was clad in a full military uniform and boots, a 40-pound pack on his back. The blazing sun beat down on him, and the hot desert sand of New Mexico’s White Sands Missile Range made the 80-degree day feel like 100. He was dehydrated and exhausted. But when a four-wheeler loaded with National Guardsmen drove up to pull him off the course, Bolstad instead filled his water bottle and kept running. Ten miles later, he crossed the finish line at a time of 8:22:09, flanked by a crowd of cheering fellow cadets who had roadtripped from Mines to run either the 13.1-mile or 26.2-mile race in commemoration of World War II service members or cheer on their comrades from the sidelines. Inspired by the experience, Bolstad, a sophomore environmental engineering student, is now training other cadets for next year’s march. In a way, he says, it illustrates what ROTC is all about. military science classes and physical and combat training during school, as well as a four to eight year service commitment (either active duty or in the U.S. Army Reserve) post-graduation. Logsdon, Malek Awad. Row 4: Jason Loving, Chris Campbell, Luke Larocque, Justin Dollar. As one of the first four schools in the nation to establish an ROTC program, and, until the 1970s, one of the only to make ROTC mandatory for all students, Mines has been integral to the program since its inception, producing more Army officers (2,400 to date) and receiving more accolades than schools twice its size. As ROTC celebrates its centennial, alumni say the program is as relevant today as ever. ROTC was officially established at Mines in 1919, under an authorization from the U.S. War Department. But the school’s close relationship with the U.S. military dates back to Mines’inception. As far back as 1873, students of what was then known as the “University Schools at Golden” could be found performing military exercises on campus under the leadership of decorated Civil War Captain George West. When Mines was officially founded one year later, the Military Department was among the first three departments established on campus. “We have had Mines students in every war since 1874,” says ROTC University Liaison Fran Aguilar, as she tours a visitor through an office decorated with black and white photos and the retired, reddish battle flag of the 115th Engineers Regiment. The precursor to Mines’ first ROTC Unit, the regiment was first established in 1909, making up one of the first engineering-focused infantries in the country. By August 1918, the regiment touched down in France amid the battles of World War I, where members put their combination of engineering skills and military savvy to work constructing and repairing roads, bridges and camps near the front lines. The following year, with World War I drawing to a close, and the U.S. military eager to be prepared for future conflicts, it established an official ROTC unit at Mines, expressly to train graduates for the U.S. Army Corps of Engineers. “Very early on, the military recognized that the Mines graduate was a unique graduate. Our students come out of school prepared to go to work,” says Dorr, now an ROTC board member who also co-authored a comprehensive history of Mines ROTC. CPT Ryan Gibbons ’09 and Hugh Evans ’49, one of the last surviving members of the 10th Mountain Division, cut the ROTC’s 100th birthday cake. Wendell Fertig ’24 famously refused to surrender to Japanese forces when they tried to occupy the island of Mindanao in the Philippines during World War II. Instead, he organized a successful U.S-Filipino guerilla force, installed a civilian government and built a communications network there. After the war, he came to Mines to head up the ROTC program. Keith Comstock ’50 had already served on the India-Burma border during World War II and earned two bronze stars during the Korean War when he was commissioned to spearhead a top-secret CIA mission, Operation Gold, to build a quarter-mile tunnel on the border of East Berlin. According to press reports, the tunnel helped British intelligence officers tap into 1,200 phone lines, accessing 40,000 hours of conversations between the Soviet Union and East Germany during the early Cold War. Comstock wasn’t permitted to discuss his work with anyone, including his wife and children, until it was declassified in 2007, 52 years after it was completed. A former ROTC cadet rappells down a rock face. Mines graduates’ unique engineering skills continued to play a key role in the military theater during the Vietnam years. “You go into a triple-canopy jungle and there is no infrastructure. It has got to be built. Guess who built it. Our engineers,” says Paul Dorr. But as the war dragged on and anti-war sentiment peaked, ROTC began to fall on hard times. Amid a wave of student and faculty protests over the U.S. military’s involvement in the Vietnam War, Harvard University expelled ROTC from campus in 1968, prompting a host of other prestigious universities to follow suit. (Only recently has Harvard invited ROTC back to campus). At Mines, anti-war protests were less common, but a group of students did petition the state legislature to ask Mines to do away with its compulsory ROTC service. As a result, it was dropped in the early 1970s. After that, enrollment declined sharply from 768 members in 1968 to 387 members in 1974, before picking back up again slightly during the 1980s. At one point, in 1991, the Army embarked on a plan to reduce the number of ROTC programs nationwide and pegged the Mines program for elimination, due to the school’s small size and a perceived lack of demand. But Bruce Goetz, then professor of military science, personally fought to keep the program on campus. He succeeded. 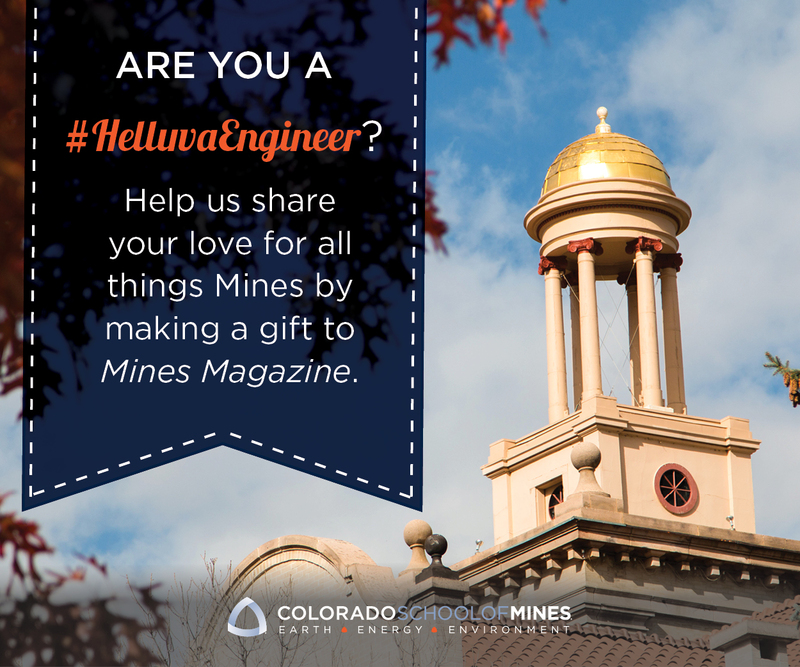 University of Denver, and other Front Range schools. In both 2013 and 2015, the battalion earned the U.S. Army Cadet Command’s MacArthur Award, recognizing it as one of the top eight programs in the nation. Those who joined ROTC in more peaceful times also say their experience shaped their lives in invaluable ways. Paul Dorr, a Steamboat, Colorado, native whose parents collectively made less than $10,000 annually at the time, said ROTC’s financial generosity made it possible for him to attend college. After graduating in 1974, he spent four years on active duty in Hanau, Germany, aiding in the construction of bridges, and then another 16 years in the Army Reserve. Meanwhile, he built an illustrious career as a strategic planner and entrepreneur in the mining industry. Janet Patev ’86 says she was attracted to ROTC because, unlike West Point and other U.S. military academies, it allowed her to get a taste of the military culture without being fully immersed in it or having to pledge right away to a post-graduation commitment. (ROTC members aren’t required to commit until their junior year). “You could go to a [civilian] college and a few times a week put the uniform on. Most of the time, you felt like a regular student,” says Patev, who spent four years active duty post-graduation. She now works in a civilian position for the U.S. Army Corps of Engineers. Herein lies another perk she got from ROTC. Buffalo Battalion cadets prepare to board the Chinook Helicopter for a training exercise on the top of South Table Mountain. When it comes to physical training, today’s Mines ROTC company is recognized as among the most physically fit in the nation. Members rise at 5 a.m. Four to five days a week for a rigorous workout (a perfect score on the physical training tests involves: 71 pushups in two minutes, 78 sit-ups in two minutes and a two mile run in 13 minutes or less.) Many climb, ski or run on the weekends, or—as Parker Bolstad did—crank their training up a notch by heading to competitions like the annual Bataan Memorial Death March. And those tasks aren’t necessarily on the battlefield. In recent years, ROTC alumni have touched down in West Africa to help with the deadly Ebola outbreak, South Sudan to provide food to starving children and Haiti to aid earthquake survivors. To John Kater, a mechanical engineering senior, ROTC has been a pleasant surprise. flown to Moldova (between Russia and Ukraine) for a language and cultural understanding program, and completed a grueling 16-day combat training camp at Fort Knox, Kentucky. himself, says it helped him become more disciplined and responsible and changed his image of the military. 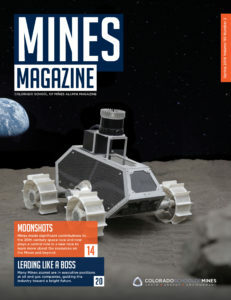 I enjoyed your article on the history of the ROTC program at Mines in the most recent Mines Magazine. While the article brought up Vietnam there was no mention of the alumni that served in that war. I would like to pass on an anecdote from my experience there that will partly fill that gap. I was commissioned from Mines ROTC as a second lieutenant in the Corp of Engineers in 1970 and sent to Vietnam in the summer of 1971 (it wasn’t called deployment in those days). From Long Binh I was assigned to the 27th Eng Battalion in Phu Bai (way up north). When I landed in Phu Bai I was feeling very lonely and bewildered about what my place in this war would be like. As I entered the terminal (shack) I heard a familiar voice call out – Bruce. It was George Barnhill from the Mines class of 1968 who had been my cadet captain and had arrived to pick me up. My best ever meeting with another Mines alum. We drove to the battalion HQ where Eloy Baca class of 1969(?) was the S-2 officer (he had been my cadet squad leader) and Major Lindroth also from Mines was the battalion XO. Talk about a great Mines reunion and a joy to see familiar faces. Even in war Mines is the best! Mines, 1970, 1975 and 1980.